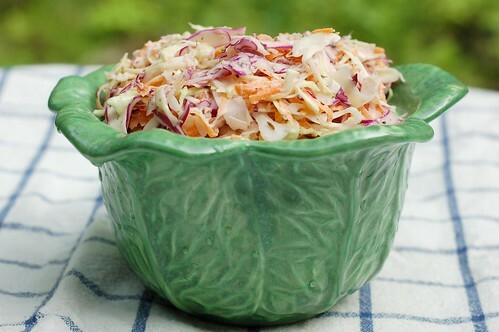 It would be terribly unpatriotic not to have coleslaw at a Fourth of July barbecue. And since I am a true American and I have also been looking for an excuse to use this completely adorable little ceramic cabbage bowl my mom gave me for months now, I made some. Thanks to my awesome hand-held mandoline by Kyocera (don't they make cell phones or something? I still have not adjusted to the way these multinational corporations produce all sorts of totally incongruous products...), it was a breeze. 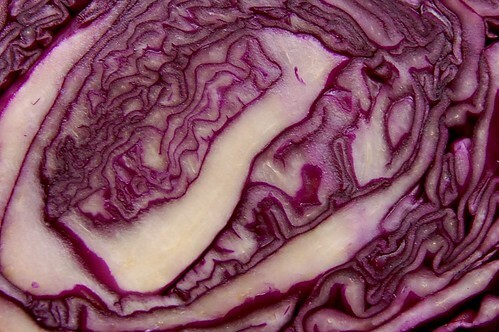 Never before has cabbage been so thinly sliced with such ease (at least not in my house). It actually made a somewhat tedious task feel fun. 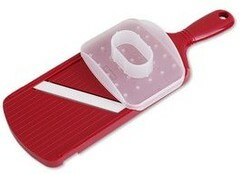 At roughly $20 a pop, this little gem of a kitchen tool is well worth the price. 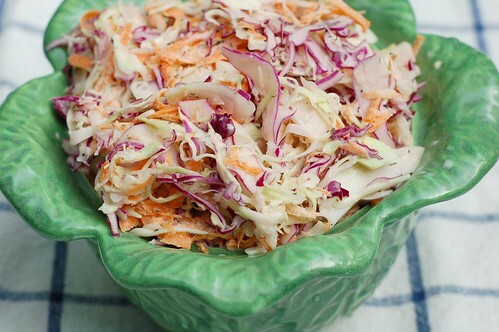 This coleslaw was the simplest, quickest part of my July 4th feast. It took all of 10 minutes to assemble using a mix of paper thin slices of red and green cabbages, onion, and carrots that I dressed in a tasty mixture of apple cider vinegar, mayonnaise, salt and pepper. 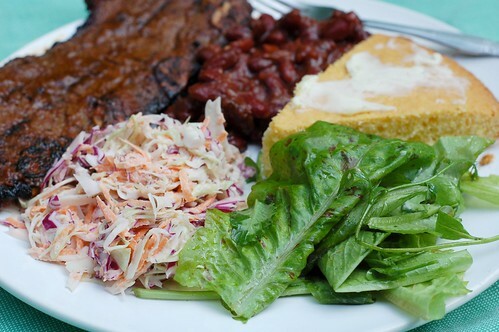 I served this with grilled ribs slathered in homemade BBQ sauce, cornbread, sweet and spicy baked beans, and a fresh green salad. I feel certain that William Howard Taft would have been in heaven. 1. Using a mandoline or a sharp knife, thinly slice the cabbage, carrot and onion or scallions and place in a medium-sized bowl. 2. Mix the remaining ingredients (vinegar, mayo, mustard, caraway, sugar, salt and pepper) together and stir well to make a smooth dressing - you'll want to mix it until you're sure that the sugar and salt are fully dissolved. Toss the veggies with dressing, making sure everything is well-coated, and serve. Wow, where did you get the great cabbage bowl? I love the bowl too!! What a beautiful bowl--and such an elegant cole-slaw too! That looks scrumptious! I might suggest that you try some pink salt "HimalaSalt" from Sustainable Sourcing (here's their website: https://secure.sustainablesourcing.com ). It really makes such a difference--and it's organic, too! Thanks for posting this lovely recipe! !